Through innovations such as new hybrids, delayed flowering, and genomics, plant breeders hope to double biomass yields of switchgrass and other bioenergy crops by 2020. As plant breeders develop perennial crops dedicated to bioenergy, they use innovations such as hybridization, delayed flowering, and genomics, aiming to double biomass yields of switchgrass in the next twenty years. They have other goals for biofuel perennial crops as well, including more efficient fermentation, and recycling more nutrients into roots. Switchgrass is just one of several perennial plants being investigated as a source for biofuels, but because the U.S. Department of Energy (DOE) selected it as one of its model crops for research focus in 1992, its development has probably advanced the farthest. 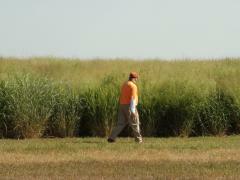 The Dairy Forage Research Center has one of a dozen switchgrass breeding programs in the United States. Switchgrass has other qualities that make it attractive as a biofuel source, including a seed that is easy to work with, adaptation across a wide geographic swath of the country, and a seed market already established for forage. 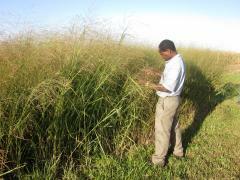 Switchgrass research has benefits beyond the biofuels and forage industries: conservation and restoration experts often look to switchgrass when seeking indigenous species to revive native ecosystems such as tallgrass prairies. Perennial crops grown specifically for bioenergy have yet to be developed, but scientists are working hard toward that goal while also developing new and/or improved bioenergy traits for forage crops. The most essential trait for a bioenergy crop is a high yield of biomass: researchers hope to double those yields in switchgrass by 2020, mainly through boosting the rate of annual gain. Plant breeders are also working on improvements such as a single annual harvest, recycling more nutrients back into roots before harvest, and delayed harvest. Developments in management and harvest practices have encouraged breeders to develop additional traits, some of which are useful for both forage and energy production. In the twenty years after the DOE chose switchgrass as a model bioenergy crop, biomass yields grew by 30 to 40 percent. Plant breeders have set their sights on another goal for the next two decades: doubling yields. For example, in USDA hardiness Zone 5, current yields for switchgrass average 5 to 6 tons per acre; scientists are aiming for 10 tons per acre. genomics, including technologies that provide more accelerated breeding programs. Plant breeders still continue to develop more vigorous switchgrass cultivars—through improved disease resistance, for example—as well as plants that adapt better to marginal growing areas. And they aim to extend the geographical range where switchgrass can be grown commercially by, for example, breeding for stronger winter hardiness. Researchers select lowland types of switchgrass that have good winter survival, trying to extend their range from the southern to the northern United States; moved north, these lowland ecotypes are able to produce vegetation (forage) for a longer period of time than upland types. more efficient fermentation, a plus for fermentation systems in ethanol production and for forage usage. improving the plant’s capacity to recycle more nitrogen (N) back into its roots before it is harvested, so growers need apply less N fertilizer. Also N is actually a detriment in most conversion-to-energy processes. Compounds rich in N do not easily convert to energy, often creating residues that become waste products. The emphasis on renewable energy has meant that some crops currently grown for biofuels compete with food crops for resources such as land, inputs, and even research and development funding. Therefore many of the breeding and development efforts for bioenergy crops emphasize perennial crops and target lands that are marginal or less than optimal for food or livestock production, such as land that is excessively wet or dry, acid soils, or highly erodible soils. More renewable energy should not lead to less global food production. A long-term sustainable energy system calls for biofuels crops that won’t compete with food crops or deplete natural resources while demanding few inputs, providing an economic benefit to growers and helping to reduce greenhouse gas emissions. They must also produce a high ratio of energy compared to the amount of energy required to produce and transport them. Post-glacial evolution of Panicum virgatum: centers of diversity and gene pools revealed by SSR markers and cpDNA sequences, Yunwei Zhang, Juan E. Zalapa, Andrew R. Jakubowski, David L. Price, Ananta Acharya, Yanling Wei, E. Charles Brummer, Shawn M. Kaeppler, and Michael D. Casler, Genetica, July 2011, Vol. 139, Issue 7, pp 933-948; PDF on BESC: Bioenergy Science Center website. Natural Hybrids and Gene Flow Between Upland and Lowland Switchgrass, Yunwei Zhang, Juan E. Zalapa, Andrew R. Jakubowski, David L. Price, Ananta Acharya, Yanling Wei, E. Charles Brummer, Shawn M. Kaeppler, and Michael D. Casler, Crop Science, Vol. 51, Nov-December 2011; PDF on BESC: Bioenergy Science Center website. Michael D Casler, Research Geneticist, U.S. Dairy Forage Research Center. CenUSA Bioenergy is a coordinated research and education effort investigating the creation of a regional system in the Central US for producing advanced transportation fuels from perennial grasses on land that is either unsuitable or marginal for row crop production.